Back in the Old West, Gunslingers wore both their gun and ammo on their belt for the ability to quickly draw their weapon. That tradition has continued to this day with law enforcement continuing to keep their side arm quite literally at their side, but unfortunately modern officers have to deal with a lot more than just their weapon these days. 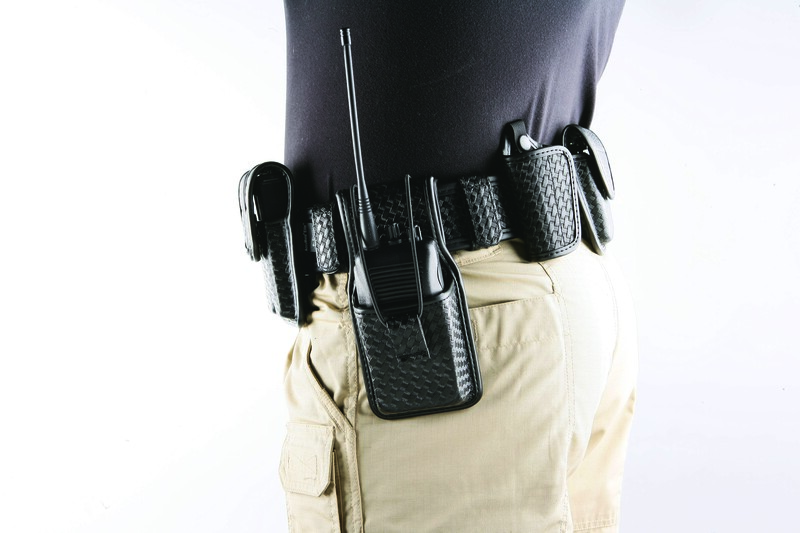 Many additions have been added to the belt over time, including the baton, glove pouch, radio, flashlight, handcuffs, TASER, and a multitude of other tools that have become necessary for the job. 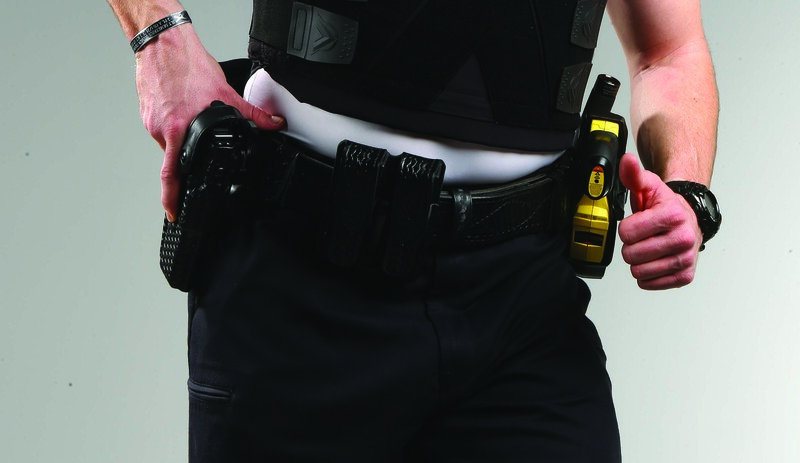 However, with all of these added tools the weight on an officer’s duty belt has resulted in severe health problems. Most belts are anywhere from ten to twenty pounds in weight, and when you’re carrying that around on your hip every day for years it can result in very serious damage to your back and spine. This pain is very real, and can often cause officers to seek early retirement or disability with lasting pain. There are a number of solutions that can help reduce the pain caused by having to carry so many important tools for the job, but the most effective way is to reduce the weight of your duty belt. Below are a few examples of ways to lighten the load of your duty belt and reduce the strain on your body. Switching out for a nylon duty belt- You might be used to wearing a leather belt, which is fine in many situations but could become an issue when you have several extra pounds strapped onto it. Nylon is typically less expensive, lighter, and much easier for maintenance than a leather belt. Some possible brands for nylon include DutyPro, LawPro, Uncle Mikes, and Bianchi. While leather may be regarded as a more professional looking option for your belt, that doesn’t account for much when you might have crippling back pain. Additionally, most leather belts have adjustment holes for the buckle a little over an inch apart, which can result in the belt either being too tight or too loose; too tight and your belt can create excessive pressure in your hip and pelvic areas, but too loose and your belt can cause problems in the event of a foot pursuit. Nylon belts allow for more accurate adjustment that will fit whatever size you need. Reducing weight of your tools – Reducing even a few ounces of weight can have a huge impact on your day-to-day effort. One of the best things you can do to reduce weight is by changing to a lighter flashlight. Additionally you can move some of the weight from the your belt to a tactical vest, which provide multiple pockets to better distribute that weight across your body. However, some departments may not allow for these kinds of vests so it’s best to check and make sure beforehand. One important thing to do is to not keep your handcuffs on your back along your lumbar spine. While this may not be an issue for officers on foot patrol, it can be a serious issue while sitting in a car. Additionally, they can cause serious injury to your spine if fallen on. Instead, keep something soft over that portion of your spine, such as a glove pouch, which can provide protection and support to that area. Supporting your duty belt’s weight – Tactical suspenders, such as the BlackHawk Ergonomic Duty Belt Harness, the Elbeco Suspension System, and Uncle Mike’s Duty Suspenders. These suspenders attach to and provide support for your duty belt without having to drastically alter what you carry on your belt. Suspenders are an effective option for reducing weight strain because they help disperse the weight over your shoulders rather than just your waist. Additionally it means your belt doesn’t have to be worn as tightly. However, the downside is suspenders could be grabbed during a struggle. Fortunately, many newer suspenders have a clip on that will release when pulled. While they have their issues, suspenders also come with plenty of positive aspects and may be considered as a good option for reducing the strain from your duty belt. While it’s true that equipment has become more advanced and necessary since the days of the Old West, taking care of one’s body should not be forgotten about. Much like any tool on your belt, your health is vitally important to your job and needs to be taken care of.